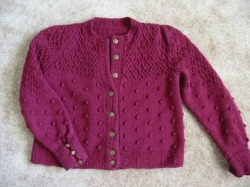 To fit chest size: 36"
Gauge:5 sts/inch and 6 1/2 rows/inch on size 7 needles. Rows 1 and 3 (wrong side): k2, * p5, k3; rep from *, end p5, k2. Row 2: k2, *sl 5 wyif, k3; rep from *, end sl 5 wyif, k2. Row 4: k4, * insert needle under loose strand and knit next st, bringing st out under strand, k7; rep from *, end last rep k4. Row 1 (wrong side): p1, * yo twice, p5, yo twice, p1; rep from *, end p1. Row 2: k1, * sl 1, drop yo’s off needle, k4, sl 1, drop yo’s; rep from *, end k1. Row 3: p1, *sl 1, p4, sl 1; rep from *, end p1. Row 4: k1, *sl 1, k4, sl 1; rep from *, end k1. Row 6: k1, * drop next st to front of work, k2, pick up dropped st and knit it; sl 2, drop next st to front of work, sl same 2 sts back to left-hand needle, pick up dropped st and knit it, k2; rep from *, end k1. Row 7: p1, * p2, (yo, p1) twice, p2; rep from *, end p1. Row 8: k1, *k2, (sl 1, drop yo) twice, k2; rep from *, endk1. Row 9: p1, * p2, sl 2, p2; repfrom *, end p1. Row 10: k1, * k2, sl 2, k2; rep from *, end k1. Row 12: k1, * sl 2, drop next st to front of work, sl same 2 sts back to left-hand needle, pick up dropped st and knit it; k2, drop next st to front of work, k2, pick up dropped st and knit it; rep from *, end k1. To make bobble: In stitch desired, k1, yo, k1, yo, k1. Turn. Sl sl knit, k1, k2 tog. Turn. K1, k2 tog, sl first st over. Back: Cast on 97 sts. Work in Little Tent pattern for approx. 3 inches, ending with row 4, then work row 1 again. Purl next 4 rows. Work in stockinette stitch (beginning with a knit row) for 4 rows. Keeping in stockinette stitch, make a bobble above every other middle stitch of tents. Work 6 rows in stockinette stitch, then make bobbles over alternate tents. Keep working bobbles alternately every 6 rows until piece measures 13 inches. Armhole Shaping: Bind off 7 sts at beginning of next two rows, beginning English Quilting on second row (wrong side). P2, then start row 1 of English Quilting, ending with p1. Continue in pattern, decreasing 1 st each side of every right side row 7 times (69 sts). Then, work even in English Quilting until peice measures 21 1/2 inches. Bind off 22 sts at beg of next row, place next 25 sts on a stitch holder, then bind off last 22 sts with another strand of yarn. Fronts: Cast on 65 sts. Work in Little Tent Pattern for approx. 3 inches, ending with row 4. Rep row 1 again. Continue to work 17 sts along button/buttonhole side in Little Tent Pattern all the way up the front, At the same time, purl next 4 rows, then work in stockinette stitch for 4 rows same as back. Place bobbles alternately same as for back, working until piece measures 13 inches. Shape armholes respectively same as for back, then work even until peice measures 19 1/2 inches. Shape neck: Place 17 sts of neckband (Little Tent pattern) on a st holder. On next row, bind off 6 sts, then dec 1 st neck edge every other row 6 times. Work even until piece measures 21 1/2 inches. Bind off. **Note: When making right front, be sure to make two button holes in center of little tents so that when it is folded over for facing, buttons will be able to go through both layers. Buttonholes: Make first set of buttonholes on Row 3 of second repeat of Little Tent pattern in the middle of the p5 (3 sts wide). Place next buttonhole on third repeat after first (still on row 3), then on every 5th repeat after that. Work last buttonhole on neckband (which will be next 5th repeat). Sleeves: Cast on 49 sts. Work in Little Tent Pattern for approx. 3 inches, ending with row 4. Work row 1 again. Purl next 4 rows. Working in st st, increase 1 st each side of every 5th row 18 times. At the same time, work bobbles in same as for back. ** At the same time, when 42 rows have been worked (from beginning of st st), start English Quilting as follows: On wrong side, p32, (yo twice, p1) twice, p 29. Follow English Quilting pattern as directed, increasing the lattice outward by doing the 2 double yarn overs at each outside edge, forming an upside down triangle. When all the increase are done (OR piece measures 18 inches), there should be 12 sts on each side of the lattice at this point and 84 sts on needle. Cap Shaping: Bind off 7 sts at beginning of next two rows. Work even in English Quilting for 6 inches. Make gathers as follows: k2 tog across next two rows, binding off on last row. Assembly: Sew shoulders together. Sew sleeve seams. Sew side seams. Sew sleeves into armholes. Neckband: Knit 17sts off the stitch holder, keeping in Little Tent pattern. Pick up 22 sts along left front, 26 sts off back holder, increasing 1 st along back, 22 sts along right front, finishing with rem 17 sts from right st holder (105 sts). Work in Little Tent Pattern for 3 repeats. Bind off on row 4 of Little Tent Pattern. Fold front facing to inside, folding Little Tent pattern in half, and tack to inside of fronts. On sleeve bands, make loops for buttons with D crochet hook by chaining 8 then tacking to center of sleeve band -- one near the bottom, one on the garter stitch at top of band, and one in the middle. Sew buttons far enough away to fit wrist snugly.